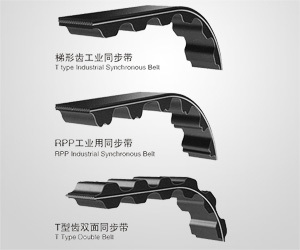 The transmission of synchronous beit is a new transmission mode and transmits the dynamic torce by the meshing of the belt teeth and pulley,lt combines respective advantages of gear transmission,chain tramission and transmission. lt may solve the problems such as low transmission efficiency and lubrication oil required under the status of high speed when suing the chain,distance limit between the drive part and the slave drive part when using the gear. Higher transmission efficiency can be guaranteed under the condittion of large change of peration speed and temperature. lts performance can be exerted stably and safely during the process of high-speed rotation.